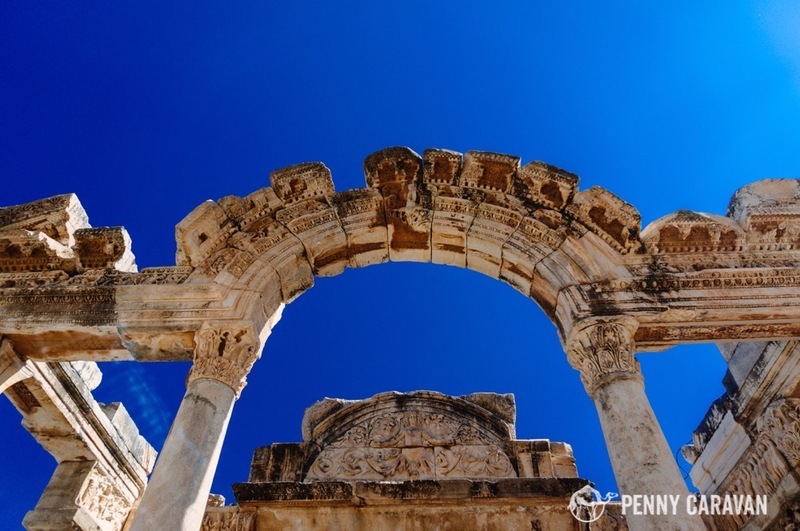 For me, the name of Ephesus conjures visions of New Testament apostles writing their letters. When we visited in 2013, I was indeed overcome with awe to be walking the same streets they walked. 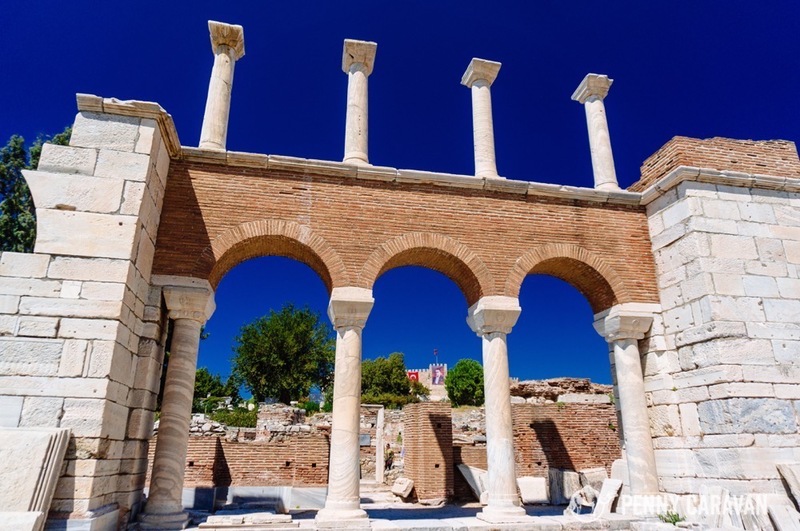 Ephesus holds great importance in the history of Christianity as both the apostles Paul and John, and Mary mother of Jesus, spent time living and working there. It’s a large and impressive site, and you will be stunned to learn that only 15% of the ancient city has been excavated. 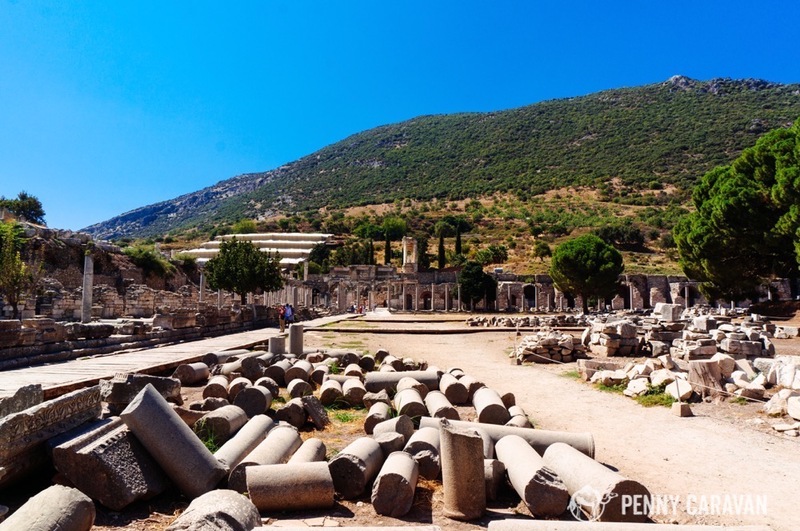 Ephesus can be visited by day tripping from Izmir (about an hour bus ride), Kuşadası (15 minute bus ride), or if you happen to be staying in the very nearby village of Selçuk, you can take a taxi. 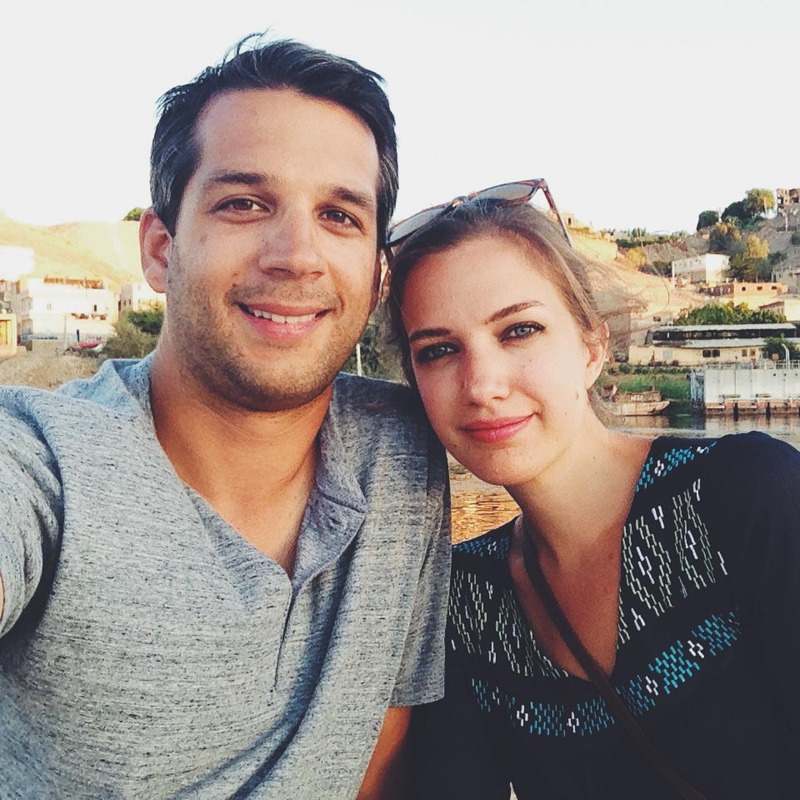 We opted to stay in Kuşadası for a few days and took the bus to Selçuk, which makes a stop at Ephesus. It actually drops you on the main road and you walk about a mile to the entrance of the ruins. Of course there were plenty of taxis offering rides to the entrance, but we had time and thought the walk would be nice. Not long into our walk though, and a man who was shoeing a horse in the fields nearby dropped everything he was doing when he caught sight of us, and bolted past us up the road. 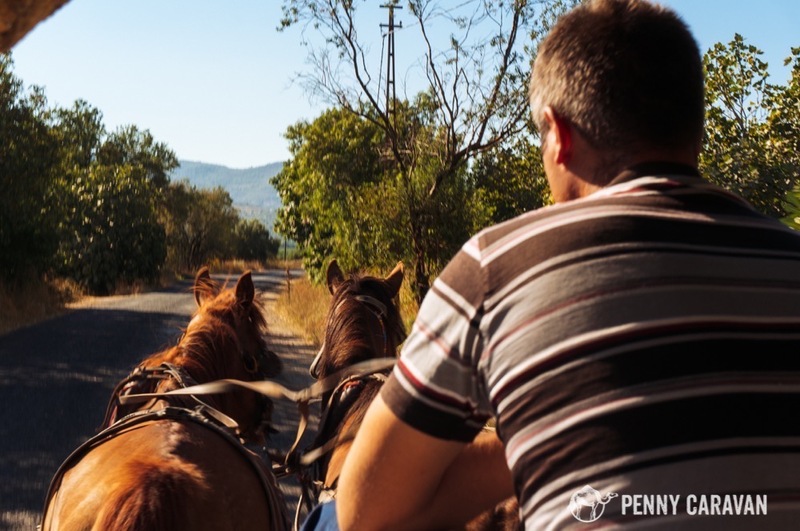 At first we were concerned, but we soon saw a horse and cart ahead, and realized the man had run all that way just to offer us a carriage ride to the entrance of the ruins. We absolutely took him up on his offer! First, he took us to the church of the Seven Sleepers which is outside the city of Ephesus. There’s no entry fee and most of the cave is actually closed off, but you can still walk into parts of the crypt. 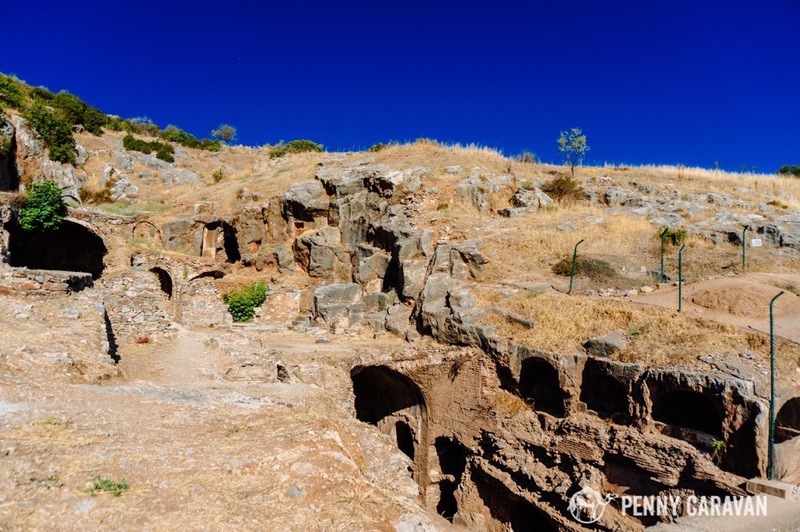 The ancient legend, which is represented in both Christian and Muslim texts, says that seven young men fell asleep in a cave while fleeing persecution for their faith by the emperor Decius. 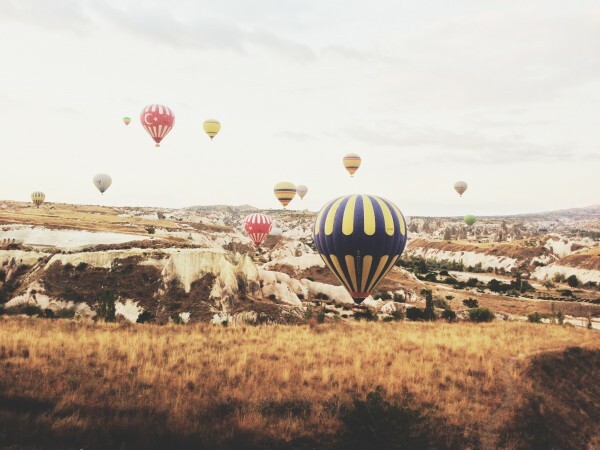 They awoke 200 years later during the reign of Theodosius II, a Christian emperor, and discovered the city which had persecuted them was now praising God for their miracle. Church of the Seven Sleepers. Shane in the crypt of the Seven Sleepers. 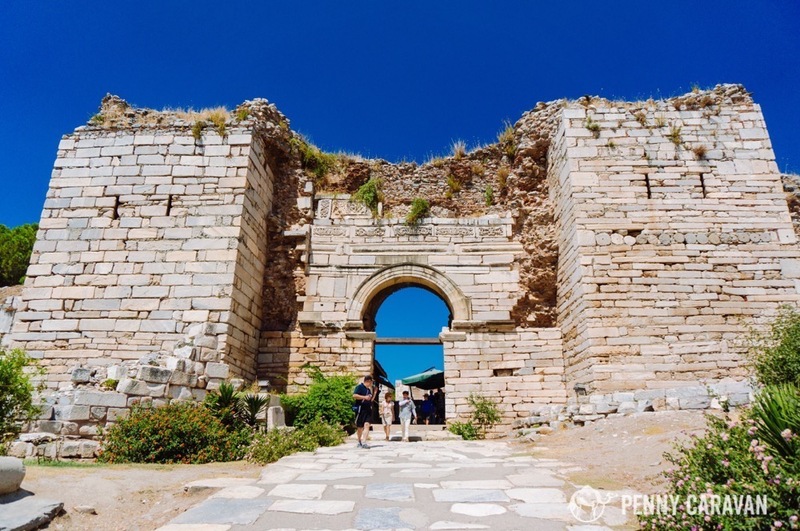 There are two entrances to Ephesus, with the one to the north being the main entrance. Our carriage driver took us to the southern entrance so that we could walk downhill through the city, ending at the main entrance. The road through the city is wide and immaculate, paved in white stone. It gives you a sense of the grandeur of this ancient city, which boasted 56,000 residents at its apex. The temples, public baths, and theaters are all situated along the main road, making for easy navigation through the city. 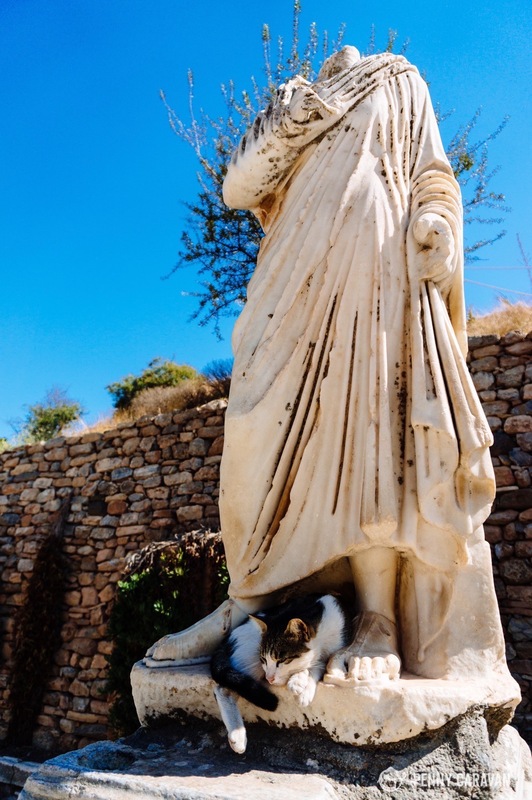 “Cats of Efes” would make a great calendar. They are everywhere! 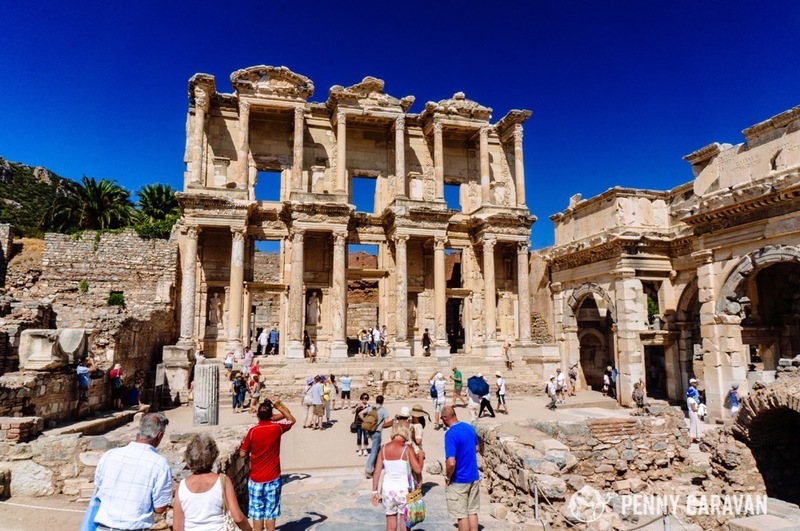 The Library of Celsus is one of the main sites, as the facade has been fantastically reconstructed from its original parts. It was built in 125 AD and once held 12,000 scrolls. The Odeon is the smaller theatre which used to have a roof! It held 1,500 people and was used for concerts and plays. The Temple of Hadrian has also had its facade rebuilt from surviving pieces. 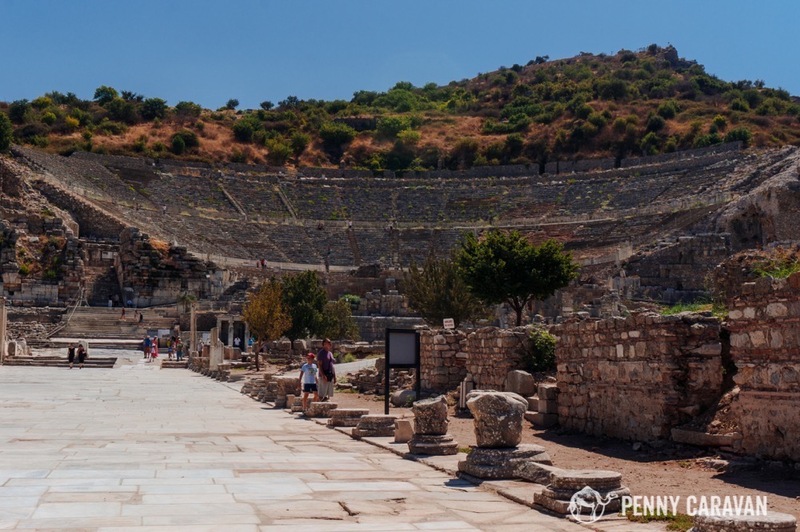 The Great Theatre holds 25,000 people and is considered the largest outdoor theatre of the ancient world. 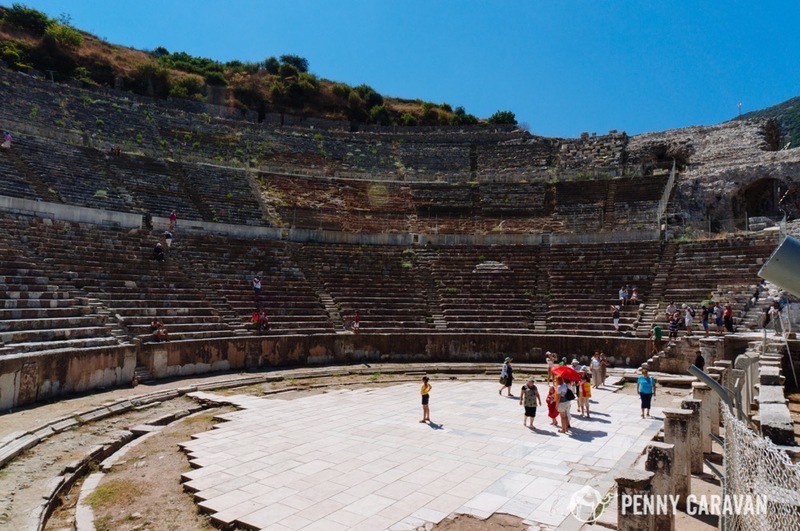 You can read about this theatre in the book of Acts in the New Testament. The apostle Paul delivered a sermon here condemning pagan worship. As many of the people sold idols of Artemis for a living, they rioted against Paul and he was chased out of this theatre, running for his very life. 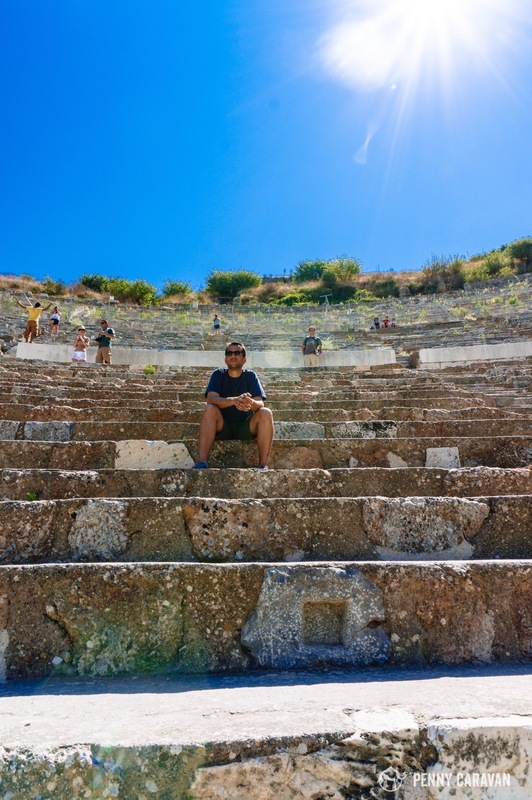 For me, this was the highlight of our visit to Ephesus—to be able to climb to the top of the theatre, sit there and imagine hearing Paul speak. And then, to stand on the stage and imagine how he must have felt to have the whole of Ephesus rioting against him. Sitting in the Great Theatre. 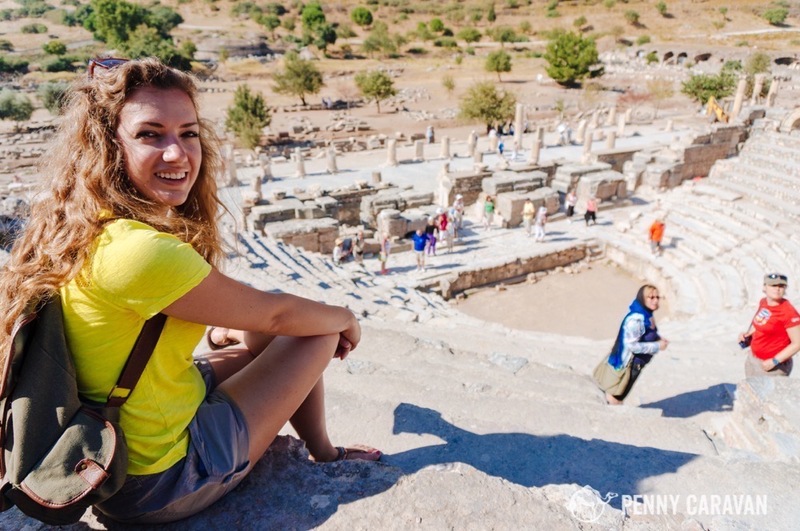 Ephesus is situated in a hill and you will be surprised to learn that it used to be a port as the Aegean sea is some 8 km away. Coming out of the Great Theatre, you will see the long Harbor Road that now only leads to the plain which was formed as centuries of silt eventually closed up the harbor. On the Harbor Road looking back toward the Great Theatre. Sadly the Terrace Houses were closed for renovation at the time we visited. 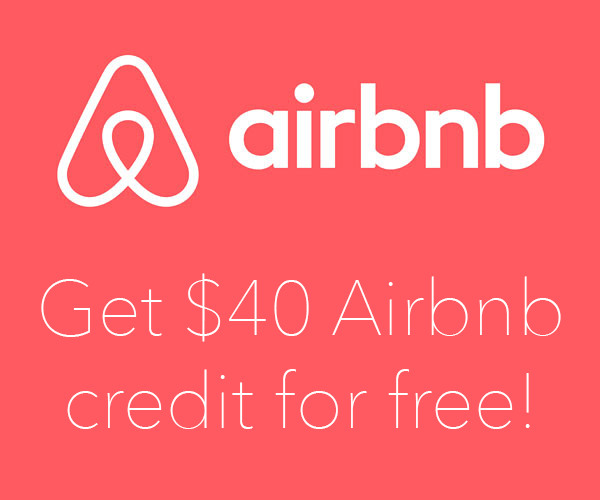 If you have the chance, you should definitely visit as it is one of the best preserved examples of the living quarters of the Romans. The painted walls and mosaic-covered floors give a beautiful picture of ancient life. Also worth seeing is the House of the Virgin Mary. It is believed to be where she spent her last days, and many pilgrims make the journey to visit this sacred site. The terrace houses are situated on the hill and are now covered by protective sheltering which you can see on the left side of this photo. 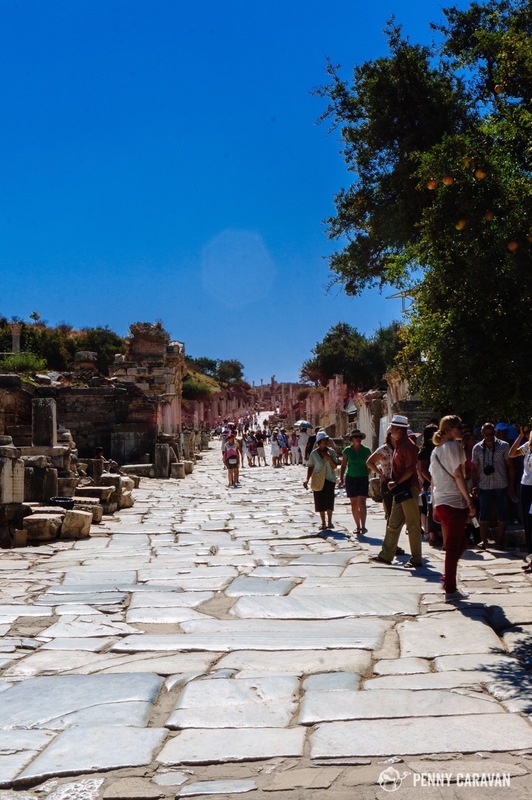 Happily walking through the city of Ephesus. 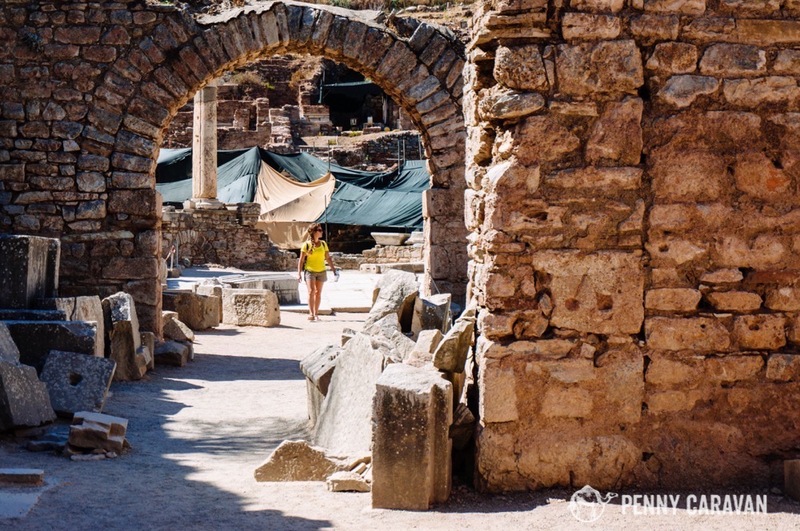 From the exit gates at Ephesus, we were able to catch the bus to Selçuk and walked to the Basilica of St John. It is believed that this hill is where he was buried, so Justinian had a cathedral built there in his honor in the 6th century. 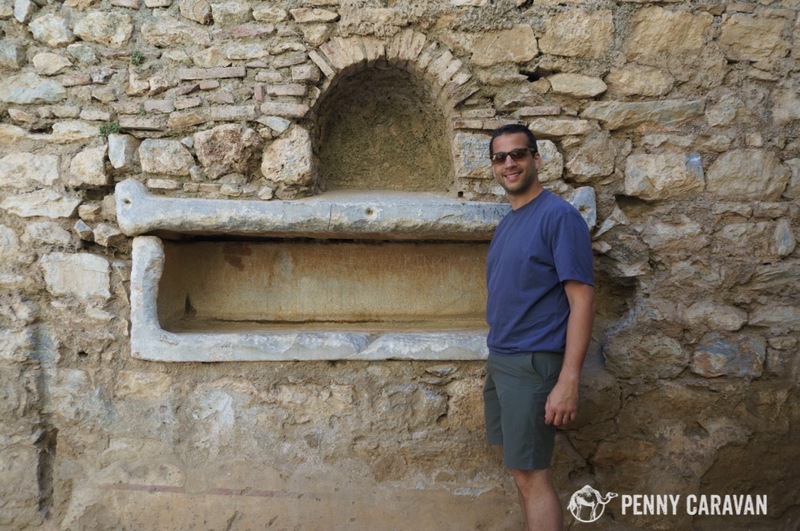 John lived the remainder of his life in Ephesus, and it is believed that this is also where he wrote the Gospel of John. Basilica of St. John entrance gates. From the ruins of the cathedral, high on the hill, you can see the single column that remains of the Temple of Artemis in the valley below. It is possible to walk right up to the ruins of the temple, but we only enjoyed the view from the hill. 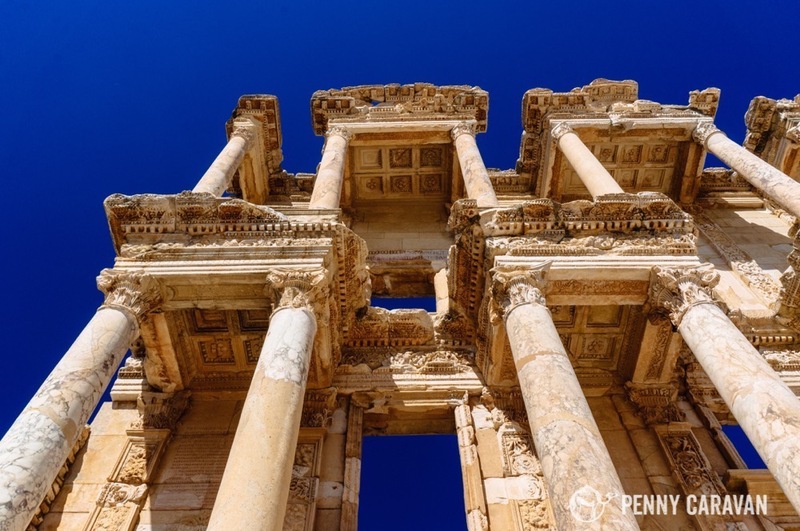 The Temple of Artemis is one of the Seven Wonders of the Ancient World. Valley view from the hill of St. John’s Basilica. 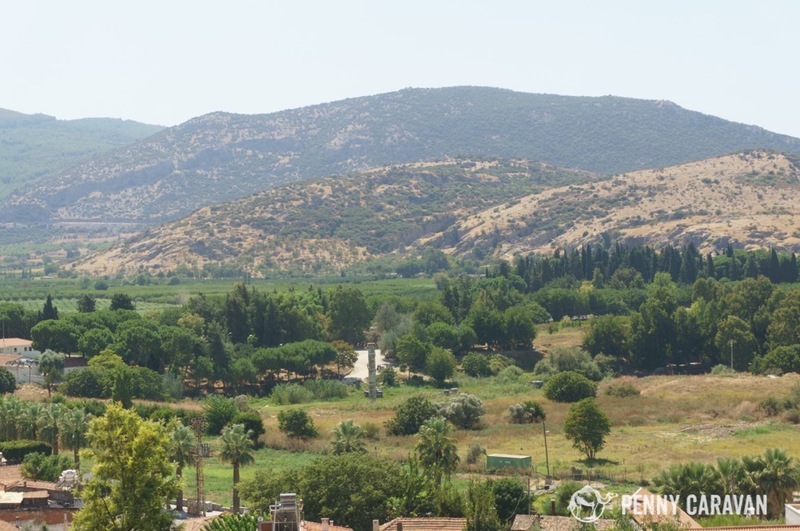 That single column right in the center of the photo marks the site of the Temple of Artemis. 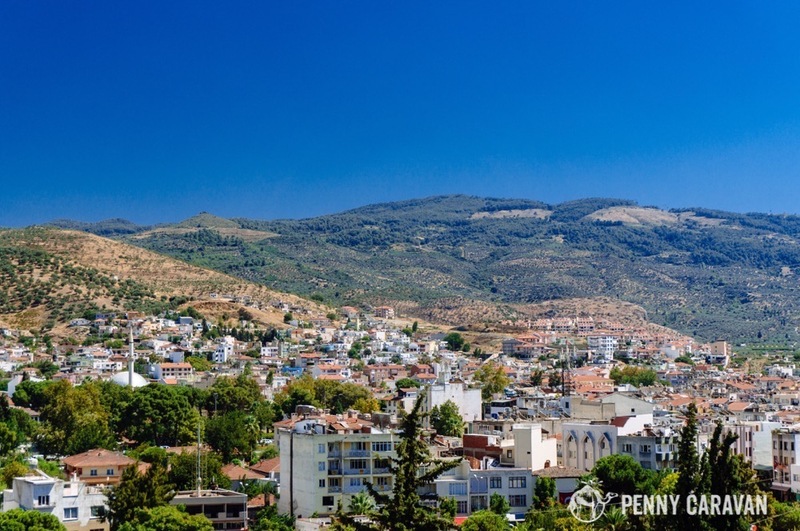 City of Selcuk from the hill. 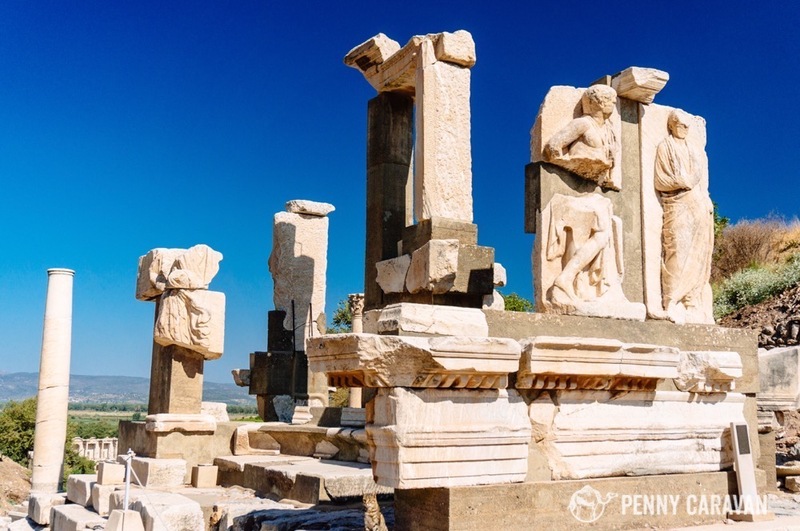 If you have more time in Ephesus, we would recommend visiting the Ephesus Museum which houses tons of artifacts from the ancient city and from the temple of Artemis. 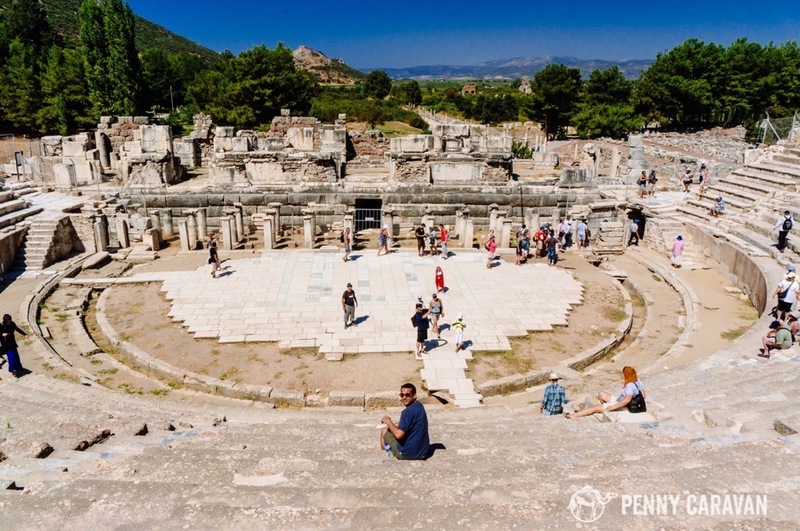 Visiting Ephesus was one of the highlights of our trip to Turkey and truly one of the most extraordinary places we’ve been. 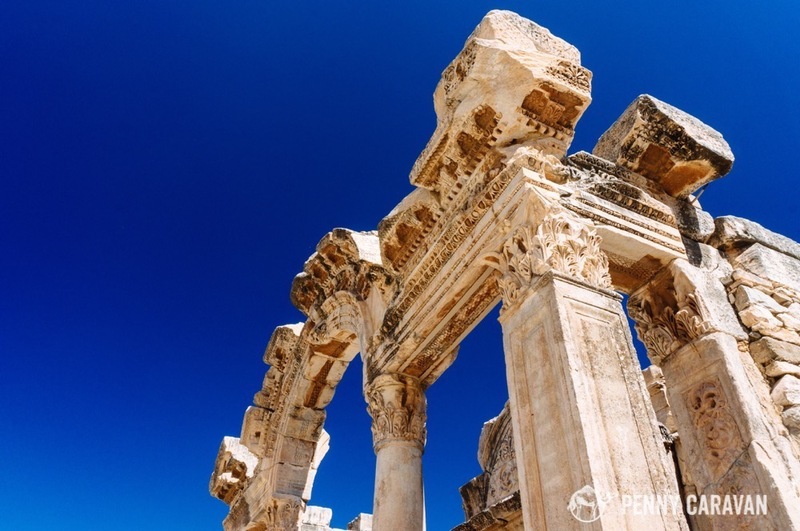 We definitely recommend adding Ephesus to your Turkey itinerary! 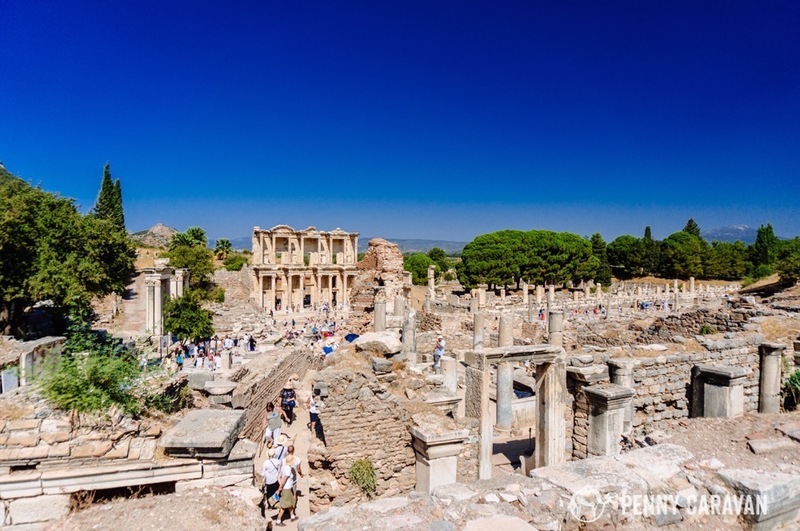 Check out our video of our trip here and see footage of Ephesus at minute 6:50.